Privacy issues are back with a vengeance. Everywhere you look now NGOs, legal experts, and government officials are raising questions about this or that online or ad initiative and privacy. The most recent privacy debacle was the Viacom-YouTube ruling, which is being circumvented by cooperation between the parties. Now, as Google formally launches StreetView images (for the Tour de France) in Europe, it faces resistance in the UK on the privacy front. In the UK, a group called Privacy International has engaged Google in a dialogue and threatens formal action around the local launch of StreetView. At issue is whether consent must be obtained by Google before including pictures of any individual in StreetView imagery. Outside the US (e.g., Canada, EU) such consent is typically required for “commercial use” of individual images. In the US it’s legal to capture images of people in public. I strongly believe that this type of privacy-enabling technology, together with effective controls for users, is the best way of meeting the challenge of respecting people’s expectation of privacy without stifling the development of new products and services that everyone can enjoy and benefit from. We have already been working with the relevant privacy regulators and groups in different countries in which we will offer Street View, including the UK. You may already be aware that Thursday’s Tour de France launch was warmly welcomed by CNIL, the French data protection authority. It would seem that the matter will accordingly be resolved. 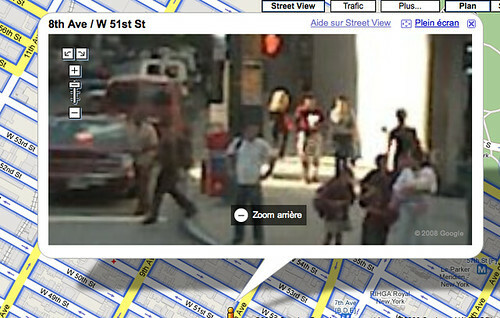 Face blurring is a balanced response to local privacy laws and Google’s intention to scale StreetView globally.